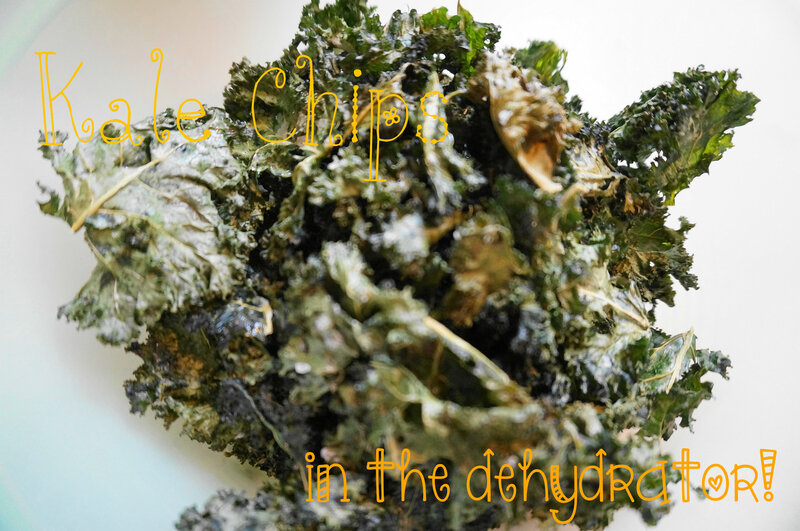 Yet Another Plug for Kale Chips. Worth It! My new camera took this shot! Cool, huh? I’m still amazed by some of the stuff this thing can do all on it’s own! Anyway, I know, I know. KALE. Sigh. It’s all the rage. Everyone is talking about it. I’m supposed to rise above the commonplace recipes of the world and post about canning salmon and other interesting things that people aren’t going to find all over Pinterest. But darn it, kale is good! 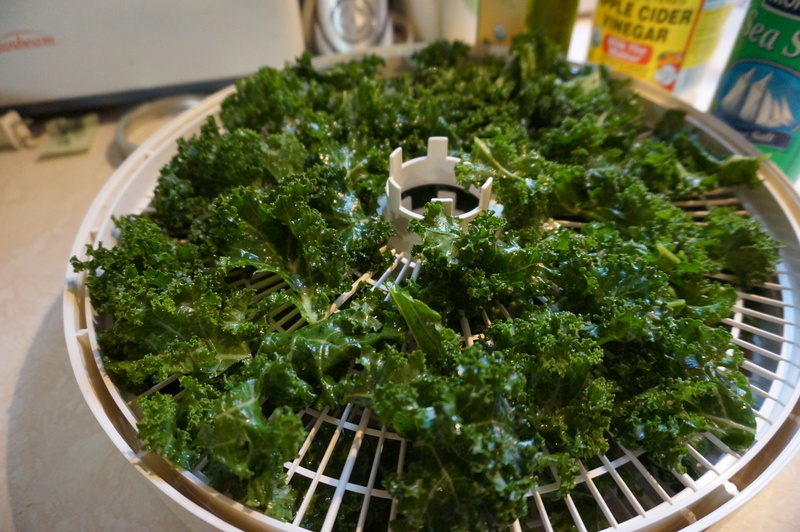 And this is totally relevant because I’m using my dehydrator instead of an oven like everyone else… heh heh! Actually, the first 10 times I made kale chips (which, by the way, is the only way I’ve ever eaten kale…) I used my oven. I followed a few suggestions I found online at various degrees of temperature for various amounts of time. The results were always the same: One third of the chips were still soggy, one third were burned to a crisp, and the remaining third was edible and addicting. 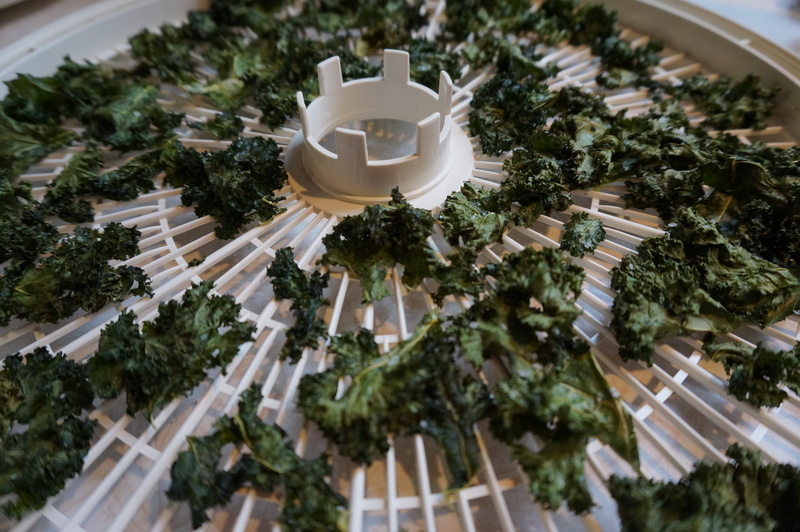 So finally my husband actually suggested the dehydrator to me! There’s lots of variations to make these, but the best that I’ve found is salt & vinegar. You can use regular vinegar, cider vinegar, or leftover sherry vinegar from your preserved garlic experiment! Tear leaves away from stems, wash and pat dry with paper towels. 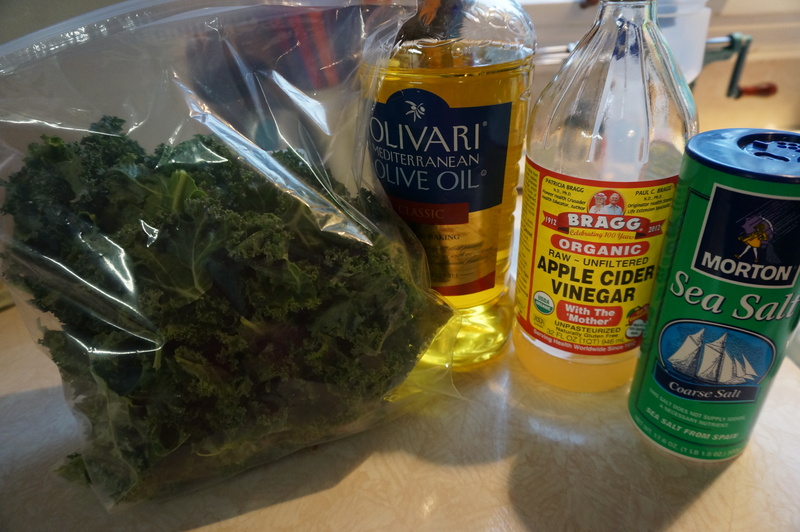 In a gallon-sized resealable bag, add kale, oil , vinegar and half the salt. Press air out of the bag, and massage the liquids into the leaves. No need to be gentle! These leaves are tough! 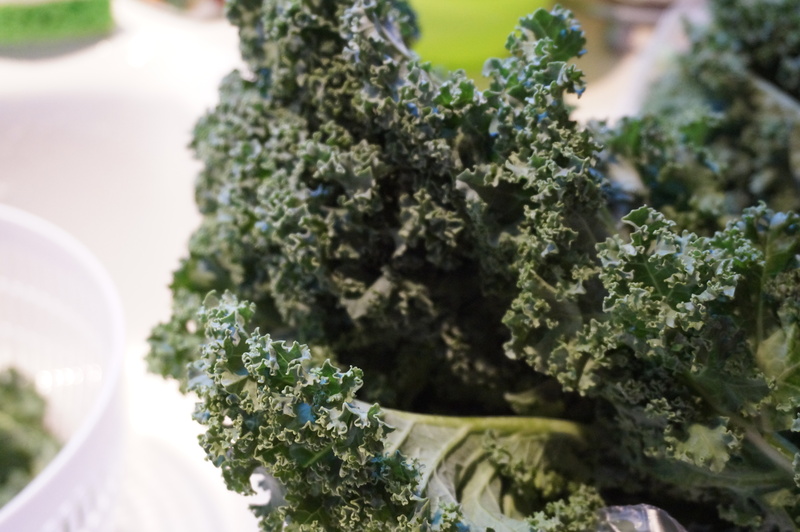 Spread the kale onto two trays, sprinkle with remaining salt. Set dehydrator to Fruits/Vegetables (135*F), turn on. After about an hour, they should be done! They should be perfectly crispy, no sogginess at all. Enjoy! And here’s the top picture without the text mussing up our view. It’s been awhile… 4 months, to be more specific. I haven’t forgotten you! Just got caught up in life! I have a few new adventures – one being that my husband, after nearly 3 years of being unemployed, got a job! He actually went into my family’s business and is LOVING it! I’m so happy for him, because he’s spent most of his career being relatively unsatisfied. Now he’s running a school catering business and putting his super annoy… incredible efficiency skills to good use! Another bit of news is that I have a “job” too! I started babysitting these two darling girls who are sisters, just 11 months and 20 months old. (Crazy people! My girls are three YEARS apart and I thought that was kinda fast!!) It’s a really good fit, having four girls running around during the day, and it makes me chuckle a little to think that with cleaning my parent’s house every other week and babysitting full time during the week, I’m actually getting PAID to be a stay-at-home Mom! Ha! A sneak peak of my new photographic capabilities! 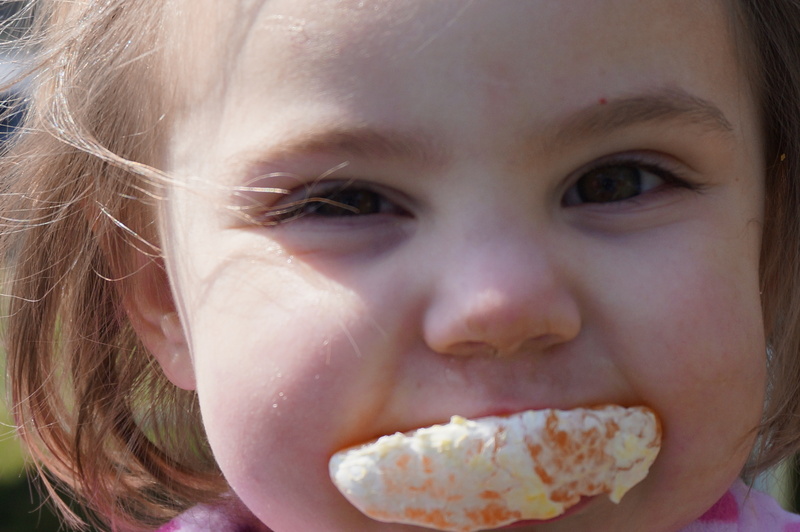 This is my youngest daughter, Dagny. Isn’t she just the epitome of summer memories here? 1. Make this in small batches. Unless you eat ketchup every single day with every single meal, you probably won’t consume an entire quart before it goes bad. 2. Do not store this in one of those cool retro red ketchup bottles or anything that doesn’t have a lid in the refrigerator, because if you do you will find yourself eating it and thinking it doesn’t taste quite right. And then you will discover mold. And then you will die of horror. 3. Do not put too much cayenne in the batch or your children will not eat it. Wussies. 4. Whilst in the “reduction” phase of this recipe, a “low boil” is NOT the same as a “simmer”. A low boil is more like reducing the heat from a high heat to a medium heat. You want the sauce to boil down sometime while you’re still young, and if you turn the heat all the way down to simmer, you will die and be buried before it ever reaches the consistency you desire. I’m actually writing from Heaven as we speak. It’s amazing up here! Say yes to Jesus! 5. Make this. It’s really good and worth buying all the unfamiliar spices for! The directions are all from The Ball Complete Book of Home Preservation, and they claim that the consistency will be thinner than commercial ketchup. I think you can probably get pretty close to the right consistency depending on your patience in the reduction phase. My batch turned out a little thinner than Heinz, but still held up nicely on a french fry. 1. 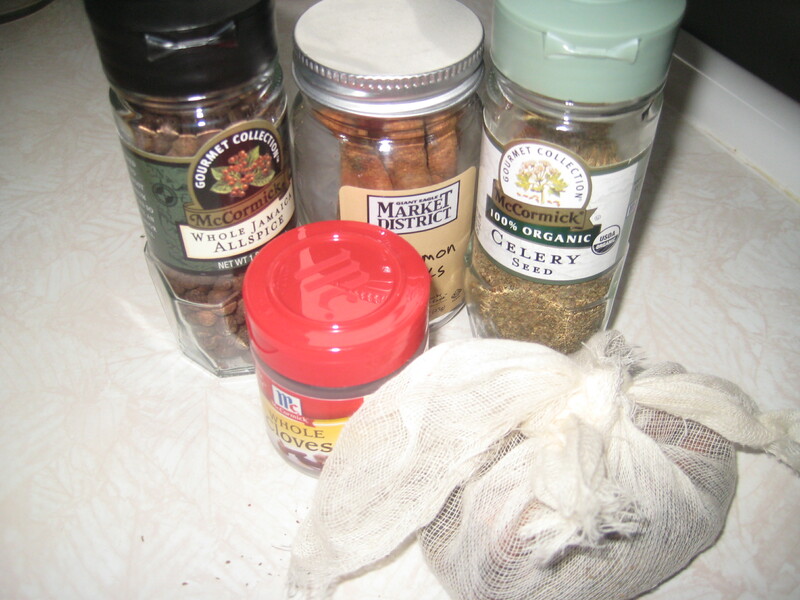 Tie celery seeds, cloves, cinnamon sticks and allspice in a corner of cheesecloth, creating a spice bag. 2. In a stainless steel saucepan, add vinegar and spice bag. Bring to a boil over high heat. Remove from heat and let stand for 25 minutes. Discard spice bag. 4. Using a food mill or a food processor and working in batches, puree mixture. 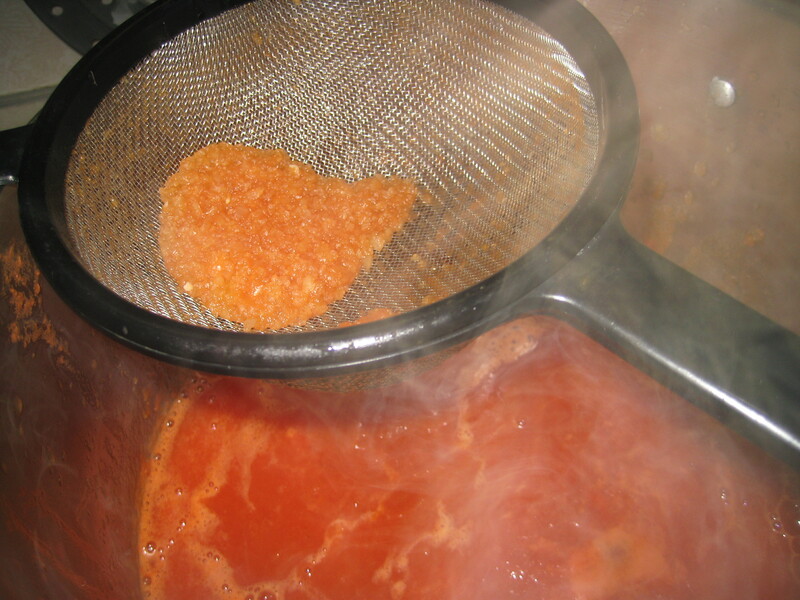 Transfer mixture to a mesh colander placed over a glass or stainless steel bowl, shaking and banging the colander on the side of the bowl to force the liquids through. Discard solids. 6. Meanwhile, prepare jars and lids. 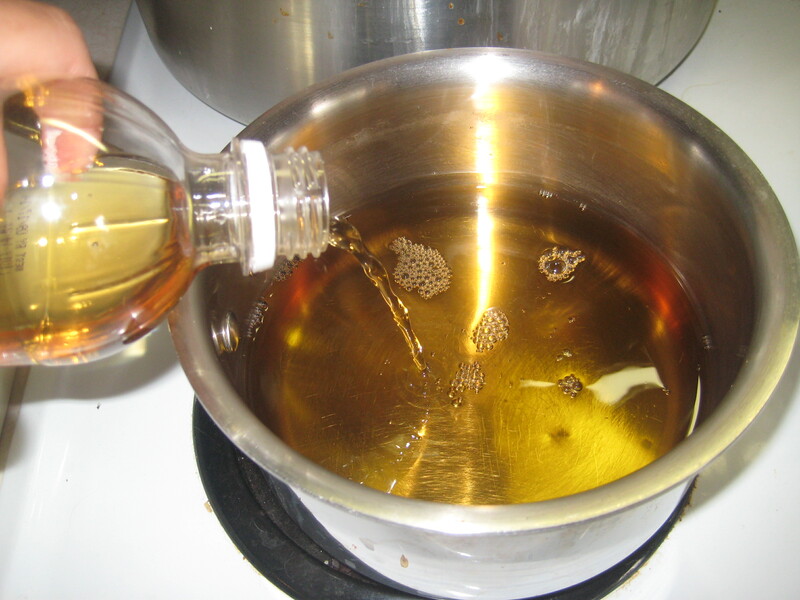 See Instructions for Boiling-Water Canning. 7. 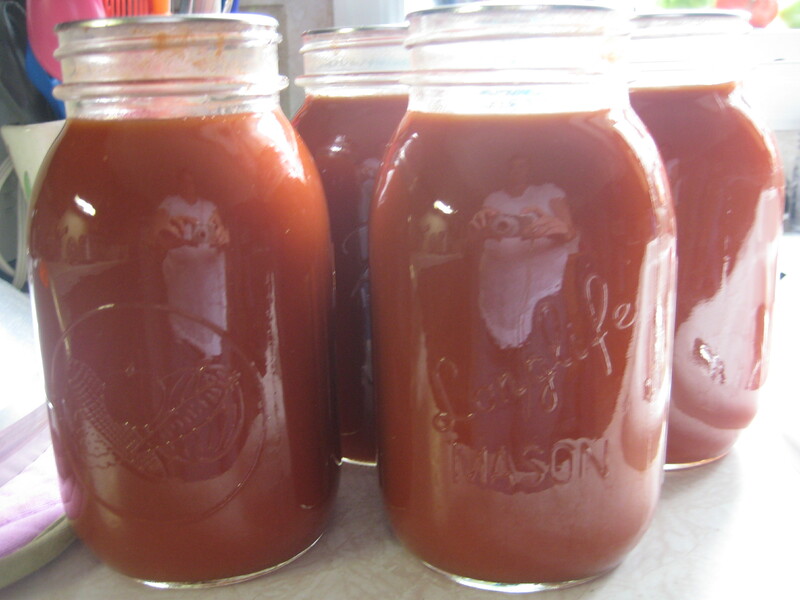 Ladle hot ketchup into hot jars, leaving 1/2 inch headspace. 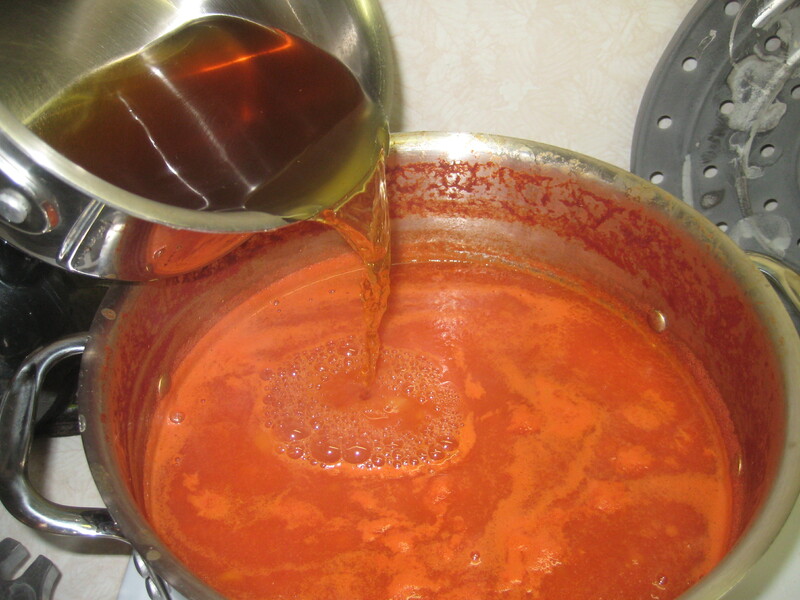 Remove air bubbles and adjust headspace if necessary, by adding hot ketchup. Wipe rim. Center lid on jar. Screw band down until resistence is met, then increase to fingertip-tight. 8. Place jars in canner, ensuring they are completely covered with water. Bring to a boil and process for 15 minutes. Remove canner lid. Wait 5 minutes, then remove jars, cool and store.